What was Gibraltar like in 1985? That is a good question to ponder as we celebrate twenty five years of Special Olympics on the Rock. Gibraltar was on the brink of a new era, fuelled by a vibrant and expanding economy as the siege imposed upon the Rock by Spain in 1969 was ending with the opening of the land frontier. Sir Peter Terry was the Governor, an Irishman and priest, our beloved Fr Devlin was ordained Bishop, Bishop Fitzgerald School opened, Gibraltar was accepted as a member of the Island Games, local rugby was once again played in the hinterland and Special Olympics International recognized the Gibraltar programme which has not stood still. It was the previous year, 1984, that Annie Risso, working in Saint Bernadette’s Occupational Centre realized that once the centre closed at four o’clock there was little for the young people to do. When the Special Olympics programme was brought to her attention Annie decided to give it a go. That year she held what were supposed to be games, but as she has since remarked, “It was no more than a school sports day”. A school sports day that with advice and help was next run along Special Olympic guidelines and the programme was accepted as an intrnational member. Once the programme had been accepted in 1985 the athletes went off to attend their first (of many) games, these were the European Special Olympics Games in Dublin, Ireland where only twenty two countries participated. 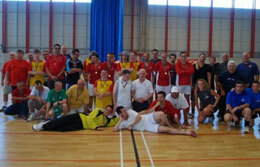 For Gibraltar at that time coaching and training was offered in two sports, athletics and aquatics. It took time to build up the trust of the athletes and their families as this movement was breaking new ground in a small place which was protective of family members with intellectual disabilities. The mission of Special Olympics is, through sports, to give athletes with intellectual disabilities continuing opportunities to develop physical fitness, demonstrate courage, experience joy and participate in the sharing of skills and friendship with their families and other Special Olympics athletes, and the community. The Special Olympics oath, Let me win, but if I cannot win, let me be brave in the attempt”, embodies the ideals of the Special Olympics movement. 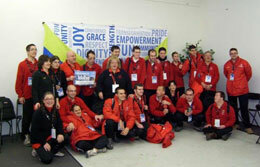 The spirit of Special Olympics is in the character and heart displayed in the effort, which is in itself a victory. Special Olympics Gibraltar athletes have proven themselves as worthy ambassadors for their homeland as they have travelled and participated at Games worldwide where they constantly exhibit the true principals of sportsmanship which is a lesson for all. That is a big lesson to learn from athletes who live in the smallest country in the Special Olympic family. Twenty five years is but a small step along the road that still unfurls before them, filled with new challenges and opportunities which our athletes will not hesitate to embrace. They will be helped by the unstinting efforts of dedicated coaches and volunteers without whom none of this would be possible. Together, we are all “Brave in the Attempt”.